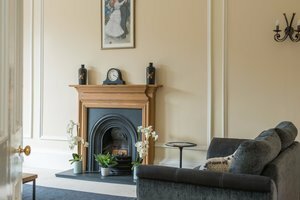 A beautiful West End apartment in Edinburgh, combining contemporary style with traditional elegance. 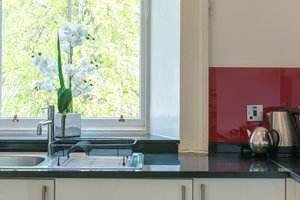 Stay in this 3 bedroom holiday rental property in Edinburgh that sleeps 6 with Wifi, Bath towels, Linen included. 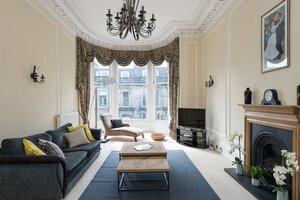 This impressive West End apartment in Edinburgh makes the perfect self-catering holiday home for up to 6 people. 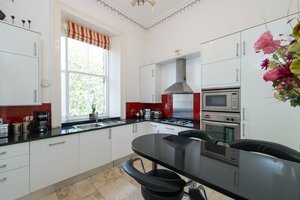 The spacious flat is spread over two floors within a beautiful Victorian Terrace. 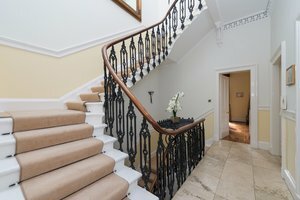 The owners have decorated it to the highest standard with contemporary furnishings and wonderful period features. It's a wonderful example of the grand architecture to be found in Edinburgh, and within walking distance of all the city's main attractions. 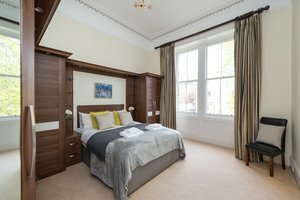 This West End apartment in Edinburgh has 2 king rooms and 1 double room. So, it would be perfect for families and groups of up to 6 people. 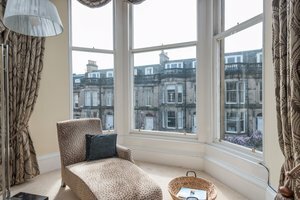 A spectacular Victorian Terrace apartment at Coates Gardens in Edinburgh’s West End. 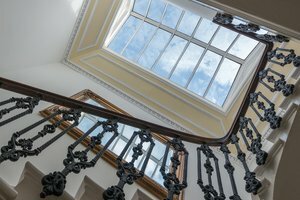 Take the sweeping staircase from the ground floor entrance up to the first floor, and you'll come to a magnificent drawing room, with fantastic large windows. There's also a fully equipped, modern breakfasting kitchen. And opposite, a smart dining room suitable for more formal meals. 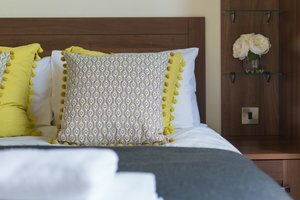 You'll also find the master bedroom on this floor, with views over the gardens to the rear and plenty of fitted wardrobes for your use. There's a contemporary shower room off the hall too. 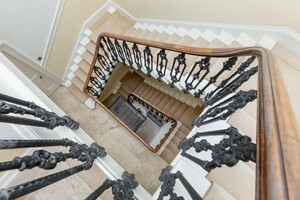 At the top of the staircase, you'll find a further two bedrooms. 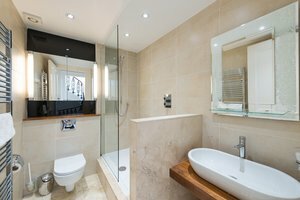 Along with a lovely bathroom with bath and shower. This West End apartment in Edinburgh is located in the west of the city centre. So you can easily get there by tram from Edinburgh Airport, getting off at West End Princes Street stop. Or, by any bus or train going to Haymarket. Parking notes As this is a city centre property, parking is restricted to roadside paid metre between 8.30 am and 6.30 pm Monday to Friday. But for longer stays, guests can choose to park their car at an NCP car park close by at FountainPark or Castle Terrace. 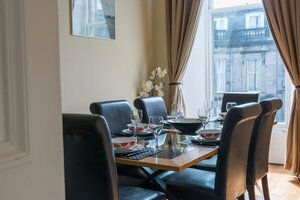 Alternatively, there is unrestricted street parking available just a short walk away in Roseburn, near to Murrayfield Stadium. 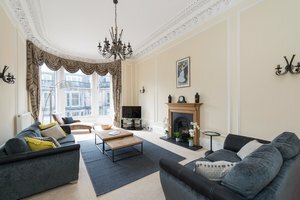 Local area This beautiful property is centrally located in the West End of Edinburgh, a vibrant and upmarket area of the city. There are plenty of boutique shops and restaurants close by, and many of the city's main tourist attractions are within walking distance. 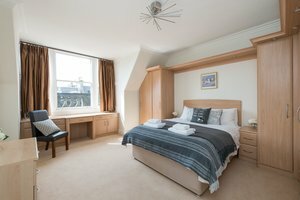 Murrayfield Stadium is also just a 10-minute walk away. So, it's perfect for those planning on visiting for the rugby. Allow Lets Get Local to contact you in the future regarding products and services which may interest you. From start to finish this was a fantastic experience! Lorna’s communication is great, timely and friendly. The apartment is extremely comfortable for 3 couples and it is every bit as grand as the pictures suggest. It is very conveniently located within walking distance of everywhere! A climb up Scots Monument is worth it for the great views over the city. The apartment is also very close to the train station (Haymarket), bus and tram stops so getting around is really easy. The zoo is only a few stops away on the bus and we were lucky enough to see both Pandas!!! We had a wonderful time and would wholeheartedly recommend Lorna’s place for a stay in Edinburgh. Lovely big apartment right in town centre. Very happy with our stay and would definitely recommend. 5 stars! This is a really spacious, luxury property a short walk from Haymarket in Edinburgh. We had plenty of room for our party of five. It is immaculately presented, elegant and a fantastic base for seeing the city. The flat is clean and spacious. 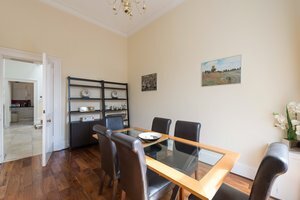 The flat is a 3-5 minute walk from Haymarket train station as well as the city tram and bus stop. This made it simple for us to get to every destination within the city with ease. My daughter and I have no regrets about having stayed at this flat. We would definitely stay here again! Nice quiet street. 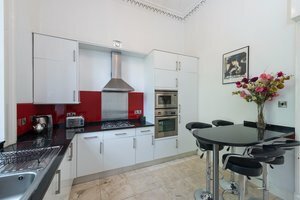 Within walking distance to Princes Street. Tram and buses also available. 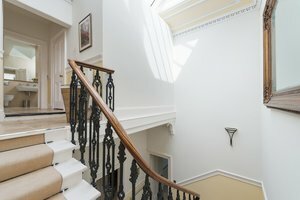 The stairwell inside the house with a transparent roof was really nice. We had a lovely stay at this beautiful property. Everything was clean and comfortable. We were very grateful to Lorna for giving us an early check in as we were flying in from the States. 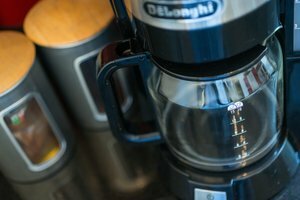 The apartment is conveniently situated for easy access to transportation to downtown with a lovely cafe at the end of the street. We all loved our stay and would definitely stay here again. A very warm and comfortable stay. Overall beyond our imagination. The rooms are very large, clean and comfortable. 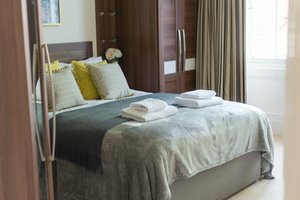 The bedrooms have plenty of room, the beds are especially comfortable and there is a lot of cupboards for storage space. The kitchen is fully equipped with cooking utensils and pots and pans. 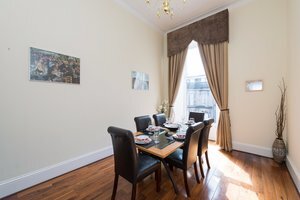 As well as being able to eat at the breakfast bar, you have a separate dining room which can be used for meals. The street is very quiet, surrounded by hotels and homes. Five-star recommendation! We had a fantastic trip to Edinburgh and the property we stayed in was wonderful. Very roomy with a great location near the historic mile and train station. The beds were very comfortable. thank you!